The first thing we are told to do in Hebrews 12:1 is to lay aside every weight. Most of the time, we are weary or discouraged because we are carrying heavy burdens, or too many burdens, or both! There are situations and thoughts that are weighing us down, heavy on our hearts, consuming our minds. Our discouragement often comes from the powerlessness we feel in our circumstances. We are stuck in our situation with seemingly no ability to do anything about it. Or we’re attempting to do something about it, but it’s not working, or it’s taking a long time. 1 Peter 5:7 tells us to cast all our cares on God because He cares for us. This is a lot easier said than done! It’s one thing to cast your cares on Him; it’s quite another to leave them there! But as with any other learned skill or habit, it gets easier with practice. It becomes more natural the more we do it. We must simply do it, and do it again, and again, and again. We start by just pouring our hearts out to Jesus, laying it all out there – what’s troubling us, what the situation is, what we need. He knows we are human. He knows we are weak. And He WANTS us to come to Him with all of this! In Matthew 11:28-30, Jesus says, “Come to me, all who labor and are heavy laden, and I will give you rest. Take my yoke upon you, and learn from me, for I am gentle and lowly in heart, and you will find rest for your souls. For my yoke is easy, and my burden is light.” Along with giving Him our burdens, we are to take His yoke (burden) upon ourselves. This is one way we prevent ourselves from taking back the burdens we just gave Him. We don’t go to the foot of the cross, lay our burdens down, and walk away empty-handed. Rather, we go to the cross, lay our burdens down, and take HIS yoke up. When we walk away with HIS yoke upon ourselves, we are actually walking an easier road. How can His yoke be easy and His burden light? Think of oxen plowing a field. Imagine a young, immature, untrained, weak ox being paired with a strong, mature, trained, experienced ox. 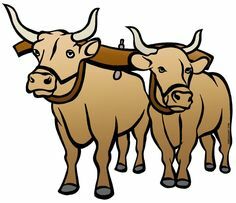 The older ox is bearing most of the weight and directing the younger ox. The younger ox might resist a little, but when it does, it’s uncomfortable. When it follows the lead of the older ox, it can walk easily, learning the ways of the older, wiser ox. So it is with us and Jesus. To take His yoke upon ourselves is to get in step with Him, to follow His lead, trusting that He knows where we’re going and how to get there. He is strong enough to carry it. Psalm 55:22 says, “Cast your burden on the Lord, and he will sustain you; he will never permit the righteous to be moved.” What an encouraging promise that is! Like a faithful shepherd, He will sustain you! When we cast our burdens on Him, we remind ourselves that we were created to need help. We are admitting that we can’t do it alone, and we are trusting Him to provide us with what we need. We are putting ourselves in the position of obedient sheep, following that Shepherd. Another way we can leave those burdens at His feet and avoid picking them back up again is found in Philippians 4:6. “Do not be anxious about anything, but in everything by prayer and supplication with thanksgiving let your requests be made known to God.” Did you catch it? The key is thanksgiving. Write out, in point form, the top 5 things that are weighing down your heart and mind right now. Spend some time in prayer – either by writing it out, talking out loud, typing it out, or simply praying in your own mind. Tell God about these burdens. Lay it all out there. Be real with Him. Now review Matthew 11:28-30 and ask God to help you take up His yoke. Spend some time reading God’s Word. If you don’t know what to read, try a Psalm or two. Keep your eyes open for God’s promises to cling to, the truth about who He is and His love and power and provision. Look for a “nugget” to carry you for the rest of the day. This post by Gretchen Fleming is a great read that explores her own experience with letting go of her burdens. It’s worth a read. What are 5 things you can thank God for today? (If you would like to share, feel free to answer that question in the comments! It is my joy to praise Him with you!) It is worth your while to develop a habit of gratitude. Train yourself to recognize what He’s done, what He’s doing, and who He is.